During my recent visit to New York’s Museum of Modern Art, a crowd gathered around one painting. We were drawn to it, as if in a dream. It was Vincent Van Gogh’s The Starry Night. Most people recognize it as a famous painting, worth millions. Perhaps they know that this painting inspired the song by Don McLean that immortalized Van Gogh’s troubled but brilliant perspective on life. But what compels us to spend time befor e The Starry Night? 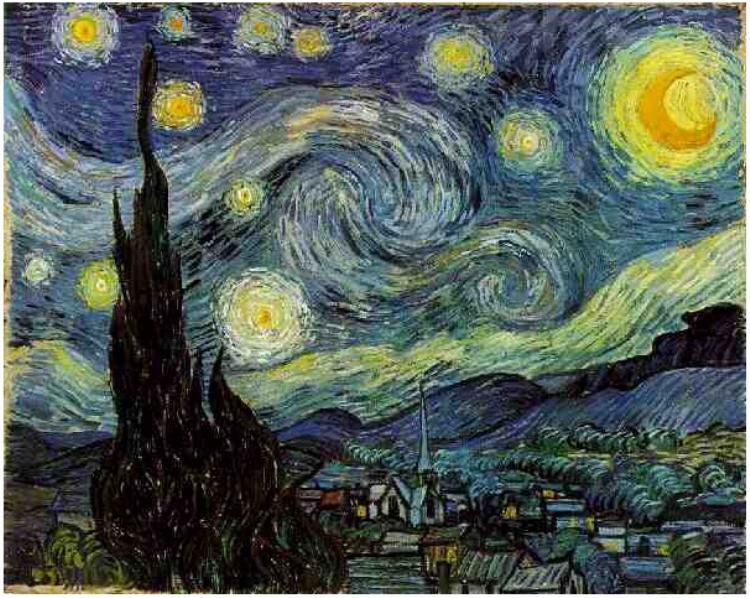 The Starry Night is more than a painting. It tells a story that opens our eyes and minds to what may exist beyond life on Earth. Van Gogh told his story using the medium of paint, but he teaches a valuable lesson to writers. Our stories need to reach beyond the sleepy, peaceful villages of our everyday life. We know, at our core, that something more exists out there, something wonderful, something magical, something spiritual. During his time, Van Gogh was little known, but his work endures and compels because he expressed what he believed in. He honed his craft, followed his passion and put down on paper a story that compels us to look at the starry sky of our soul and wonder. This is what we should strive for as writers. 1. Endlessly rewriting the first fifty pages before soldiering on and finishing the novel. It’s almost an addiction. I can’t stop myself from rewriting. Of course, I have valid reasons, like trapping my hero at the top of a volcano, only to realize that he has no reason to be there in the first place. I try to monkey wrench in the setting. Maybe he needs to stop explosives from blowing up the volcano, or he needs to steal the remote transmitter that will signal in the villain’s strike force. I feel that it’s too good a scene to simply abandon, but it’s just not working. The good news is I think I’ve found a cure. More on that at the end of this post. 2. Making a walk-on character too intriguing. In the opening scene of my current work, my beta readers, the men anyway, all love the wisecracking, edgy pilot. I love him, too. But he is just a device to land my heroine on the mysterious island and into the middle of the action. Still, I just may bring that pilot back in the end. A character who was going to be a walk-on in my thriller, The Seventh Stone, made himself so valuable that he is now in my work in progress. 3. Writing a prologue. The debate rages on this one. But with Ebooks, I think more than ever you have to start right off with your hero in the action. When potential readers “Look Inside” your Ebook on Amazon, you have very few pages to involve them in the story. The easy solution to this “mistake:” Replace the word “Prologue,” with two words, “Chapter One,” and tie it to my cure for endlessly rewriting the opening scenes, which I reveal below. 4. I’m not entirely convinced on this one, but more and more I’m seeing that the traditional “front matter,” including the copyright page, should come at the end of your Ebook. Many readers do not want to scroll through pages before reaching Page One. Wherever you decide to place the copyright page, include a link to your website. 5. Trying to weave in too much backstory too soon, while neglecting the main focus of the story. Often, writers do a great job with a hook in the first paragraph, only to backpeddle and try to justify it with backstory in the paragraphs that follow. Keep the story moving forward. Once the reader is strapped into the rollercoaster, let it rip, and don’t stop until the end of the ride. I now know just what to include in my opening pages and why. Every line has to tie in with this main focus of my story. If you’re struggling with a scene that just doesn’t feel like it’s working, ask yourself if it is focused on propelling your main character, and your reader, to that moment of truth. A series character makes it easier for a reader to buy a book, and sometimes encourages them to buy previous books in the series. You can’t design a series character to be succesful. Let the character be himself and hope for the best. Don’t worry whether the character will be liked or disliked. Allow the main character to be a little rugged, a tad dastardly. Many writers use a sidekick to be the tough one so the main character can remain pure. The main character should have those “dark” elements. This can work well with female characters, too. On character development, Child believes his readers are looking for the same character in different situations. Series characters don’t even have to age. Readers can always count on Jack Reacher. This works well for Jack Reacher, but not for all series characters, like Harry Potter, or Christa Devlin, the main character in The Seventh Stone, who are altered dramatically by the experiences. But the most important tip Child offered: Be yourself. Close your eyes and jump. Don’t be intimidated. Prince William honored his late mother, Princess Diana, by passing on to his fiancée, Kate Middleton, the stunning sapphire ring that Prince Charles had given Diana. To me, it is a reminder of another sapphire ring in Britain’s history, belonging to Saint Edward, and the undeniable attraction of gemstones. In researching my thriller, The Seventh Stone, I was intrigued by the fascinating and storied histories of some of the world’s most famous gemstones. Edward, King of England from 1042 to 1066, also wore a now famous sapphire ring. According to legend, the generous and kind Edward, upon meeting a beggar while travelling, had no money to give the man. Instead, Edward gave the beggar his sapphire ring. Years later, in Syria, two British pilgrims got lost in a storm. A man guided them to safety. He gave them a sapphire ring to return to King Edward. The man explained that he was Saint John the Evangelist, and he had disguised himself as a beggar when he met King Edward. He asked the pilgrims to return the ring to Edward, and tell him that the King would be rewarded for his generosity and piety in the kingdom of Heaven in six months time. Six months after the pilgrims returned the ring, King Edward died of natural causes. Edward became a saint. The sapphire from his ring is now in the Maltese Cross topping the Imperial State Crown of Great Britain. Of course, that’s the short version of the story. Edward’s Sapphire also shares a legendary history with a powerful Biblical artifact. But to learn that chapter in the story of Edward’s Sapphire, you’ll have to read The Seventh Stone. This headline might sound like an oxymoron followed by a non sequitur, but this photograph is proof that it’s true. The spires in the background belong to New York City’s Saint Patrick’s Cathedral, one of America’s, and Christianity’s, most inspiring places of worship. The statue in the foreground is an art deco rendering of Atlas, the mighty, mythological Titan who carried the heavens. In this statue, Atlas is carrying an armillary sphere, a model of the heavens popular with Renaissance scientists to teach and learn about the movement of celestial objects. Only in New York? No, but it certainly was fun to include this setting for a shoot-out scene in The Seventh Stone. No, I’m not talking about readers. I do have faith that you are out there, no matter what my Amazon ranking implies! When I see these amazing NASA images of the vast universe, I am both humbled and inspired. And I’m reminded that the best fiction is those stories that leave us with questions, not answers.